Design work started in 1955 by Stanley Hiller Jr and Hiller Aircraft Corporation received a manufacturing contract and funding from the U.S.A.F to build the only X-18 ever produced, serialled 57-3078. 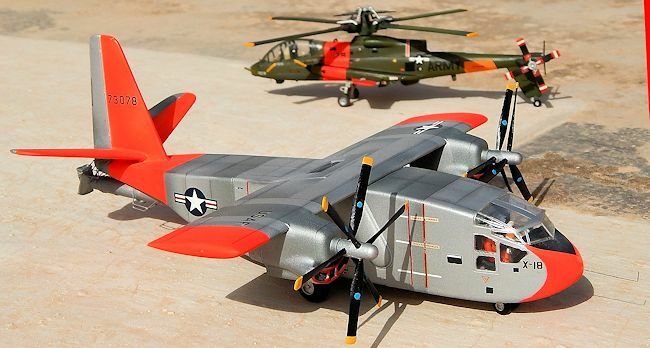 To speed up construction and conserve money the plane was constructed from scavenged parts including a Chase YC-122 Avitruck fuselage, 49-2883, and the turboprops came from the Lockheed XFV-1 and Convair XFY-1 Pogo experimental fighter programs. The tri-bladed contra – rotating propellers were a giant 16 ft (4.8 m) across. The Westinghouse turbojet engine had its exhaust diverted upwards and downwards at the tail to give the plane pitch control at low speeds. 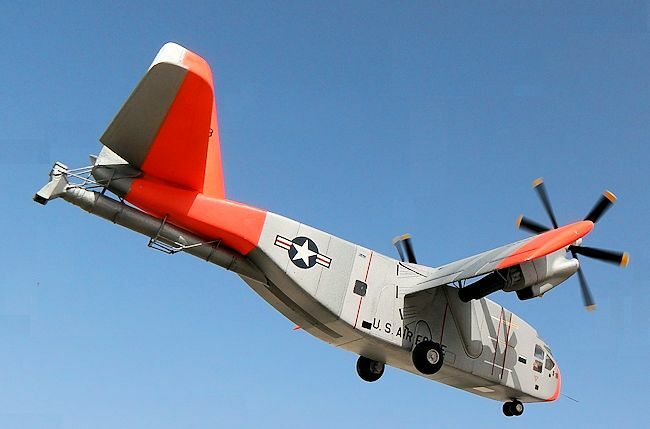 Hiller nicknamed their X-18 the Propelloplane for public relation purposes. 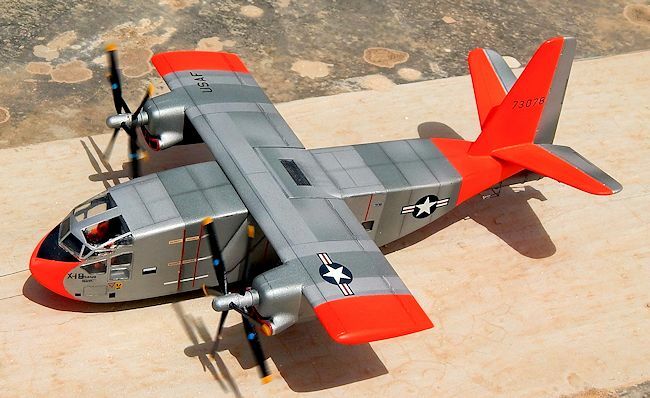 The X-18 with partially rotated wings. The first test flight was on November 24, 1959, ultimately recording 20 flights out of Edwards AFB. A number of problems plagued the X-18 including being susceptible to wind gusts when the wing rotated, acting like a sail. In addition the turboprop engines were not cross-linked, so the failure of one engine meant the airplane would crash. Thrust control was through throttle changes, which were too slow for acceptable height and roll control. On the 20th and final flight in July 1961, the X-18 had a propeller pitch control problem when attempting to convert to a hover at 10,000 ft and went into a spin. The crew regained control and landed, but the X-18 never flew again. However ground testing of the tilt wing concepts continued. Eventually a VTOL Test Stand was built on which the X-18's vertical takeoff and landing and hover control was to be tested. One engine run was successfully conducted to the full 15-foot wheel height on the VTOL Test Stand. The program was cancelled on January 18, 1964 before further VTOL Test Stand testing could be conducted, and the X-18 was cut up for scrap. 1. Cross-shafting between the engines was mandatory in order to avoid loss of control in the event of an engine failure. 2. Direct propeller pitch control was mandatory for precise height and lateral control during VTOL and hover. The turboprops drove 6 bladed Aeroproducts 14 ft Diameter contra rotating propellers The convertiplane had a maximum speed of 253mph and a service ceiling of 35,300 feet. The kit released by Aurora in 1963 which is an ex-Comet model kit, same mold; same parts. The kit comes in a beautiful classic box art. It is complete with instructions and a decal sheet which has yellowed a bit due to age on the kit. The kit features recessed panel detail, and has several working parts which was an important feature in those early days of Aurora kits. These included two sets of contra rotating propellers, tilting wings at different angles, rotating wheels and a nose wheel that swivels. The instructions has five stages of sub-assembly: the engines, undercarriage, fuselage, wings and final erection of all the sub assemblies. The kit has 45 parts and 9 clear parts. Having down loaded scale plans of the X-18 this indicated that the main diference between the kit and drawing was the additional trunking that connects to the ducts at the rear of the aircraft. The first step was to separate the two way aft duct box cut away from the rear fuselage. The area was then made flush with a little filler and sanded to shape. The kit was then assembled following the instructions. As I had the intension to preserve even the working parts of the kit as released I also assembled the engines and props without the normal procedure of painting these and which were normally left till the end when they are put on the kit. The tilting feature of the wings was also operative ensuring that the wing elevator rods were free to retract. A stand socket at the base of the kit was blanked and sanded smooth. The long trunking fitted at the base of rear fuselage was made from a B-29 internal travel shaft which was surplus from previous kit assembly. This had a similar diameter to the trunking that was connected to the jet engine which helped to provide part of the lift and overall stability of the X-18 when in flight. This was measured and cut to the correct length one end of which had the duct box and the other end cut at a chisel shape to conform to the rear slanting fuselage. Many of the rings on the outside of the B-29 tunnel were removed by careful filing and only four of these were retained. The trunking was secured with a set of brackets that I made from metal wire. Finally a nose probe was added to the fuselage. Other detail that was added to the kit during assembly was addition of elevator control links which were made from metal wire; a complete cockpit office with two crew seats, cockpit floor and bulkhead. Two fire extinguishers added to the wall, central console and cockpit coaming. Lead weight was secured to the forward nose area. Rectangular heat resisting plates were made from thin plastic card and fitted right between the engine exhausts and lower wing panels. The kit was airbrushed overall silver with wing tips, nose and rear tail assembly in day-glow orange Model Master Paint brand. Aeromaster decals provided the Air Force legends and Micro scale national insignias added, propeller bladed painted acrylic black with yellow wing tips. Light blue spherical Aeroproducts emblem on each blade was hand painted decal. Kit was finally given two coats of Klear followed by an overall coat of semi gloss lacquer. 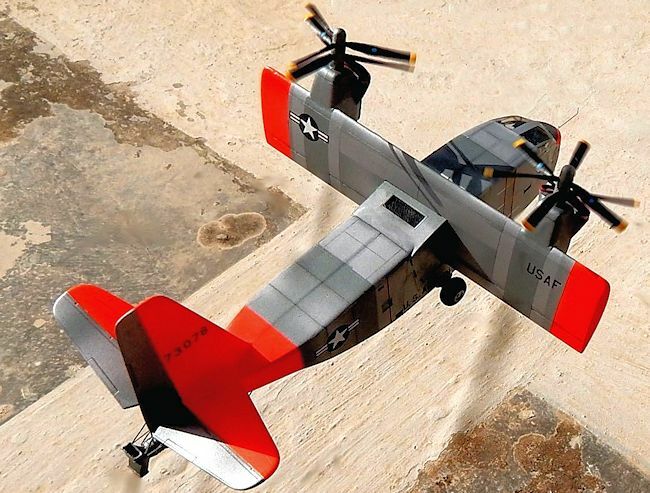 In spite of the age on the kit it was found to be accurate in every respect and the project itself regenerated important past history in the early research and development of the convertiplane concept, an evaluation programme that would otherwise remain unnoticed but which was already underway long before the emergence of the V-22 Osprey development concept.